Each player takes the role of a Magus – a powerful wizard – on their quest for ever greater magical power. Along the way they may entreat with Faeries or crush their magical essence from their broken bodies. They may bargain with the Demons of the One Below for power, or dedicate themselves to serve the One Above. They may seek out and drain raw mana from the world from which to study the Arts, and gather the resources to build up their laboratory and libraries where they study the great arts. Their aim is to seek the knowledge and power to carry out the Great Rites when the stars are right and bind into themselves the essence of magic itself. 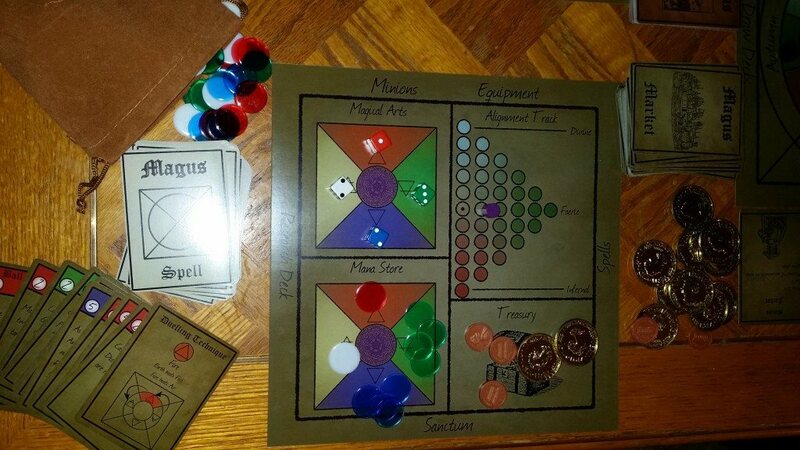 Magus the board game brings the freedom and flexibility of role-playing to a board game, giving players options and choices to make without setting out what path to follow or in what sequence to carry out actions. The innovative season based turn mechanic ensures the world turns on its cycles around the Magi as they act, constantly offering them new options to consider. It stresses high levels of player interaction with trading, duelling and competing for objectives while excluding player elimination.